I love Trevor Noah and I loved this book. This book is a glowing tribute to his Mom. She made him the man he is today. Also moments of nostalgia for me as well. All my memories of living in South Africa. Some places he had been. The drive-in he mentions is the same one my father worked at and where I spent many nights. 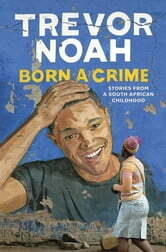 Anyone who likes Trevor Noah should read this. A case of triumphing over adversity. During apartheid, it was illegal for interracial couples to be together. This books takes you on a ride through the apartheid in South Africa and the democracy that came later. A journey filled with hardship and hardwork, written in a comic and sarcastic Trevor's way !